(9:30 a.m. EST) -- Celebrity Chef Roy Yamaguchi, known for his distinctive style of Hawaiian fusion cuisine, has been dreaming up dumplings for his specialty restaurant, debuting on MSC Seaside late this year. "When it comes to making a dish, it's a long process," he told Cruise Critic in an interview at the New York Times Travel Show in New York. "I think about it and then make it for the first time, then add stuff, minus stuff." His restaurant -- a scoop for Cruise Critic readers: It's going to be called Asian Market Kitchen by Roy Yamaguchi -- will have three sections and be located on the ship's top deck. The first will serve pan-Asian food in an a la carte setting, with sauces and a cooking style similar to what you'd find at Roy's signature restaurants around the world. The second section of the restaurant will be a Teppanyaki-style room that will still have pan-Asian flavors, Yamaguchi said. A sushi counter will round out the options. "It will be three distinctive styles of cooking, all within one restaurant," he said. 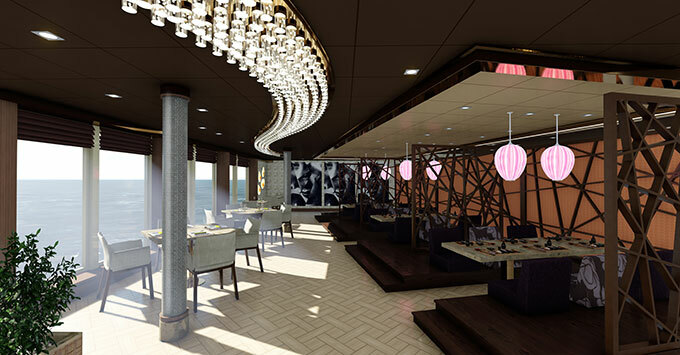 All in all, the restaurant will have between 100 to 120 seats and will be an extra fee, beyond the ship's fare. Now, back to the food, which Yamaguchi admits is his favorite topic. "I really want to make this restaurant special, really a one off," he said. "I have a dumpling dish that I created for this restaurant. It's going to be pork and shrimp and crab filling that is going to be in a won ton-style wrapper." Once the dumpling is boiled, it will be served with a sauce that "has some sesame oil, some chili sauce, some soy sauce, some rice wine vinegar, green onions, some cilantro. Then it's topped with fried garlic and shallots and frisee lettuce." Hungry yet? "When I talk about food, I can go on forever," Yamaguchi said. Beyond developing the dishes, Yamaguchi has been involved with the kitchen and interior designers to ensure the space fits his culinary vision. "I wanted to make sure that the entire process was felt by me, so the guest will feel what I feel," he said. "We'll put everything together so when someone comes into the restaurant, they feel as if they belong there, they become part of the restaurant also." MSC Seaside sets sail in December 2017 and the chef will be on the inaugural cruise. It's not the first time Yamaguchi has cruised, but Seaside, which will have 5,179 passengers, will be his maiden megaship sailing. His previous cruises have been on the Nile and on the Croatian coast on smaller vessels. "I'll be there with a bottle of Champagne," he said.